Getting Ahead In The Working Life: So Your Boss Offers You A Manager Position? Samantha (she prefers Sam) greets the drivers with a big smile and their perfect coffee drink. Sam claims that the secret to a thriving latte stand is well trained baristas and a great attitude. She should know. She lives in a Seattle suburb where dozens of coffee shops, stands, and cafes are everywhere. She always makes time to chat with customers about their lives and activities. She entered the job market after high school graduation wondering how to make a life for herself. She loves traveling and photography but in order to do any of that, she needs a good job and low rent! For now, she lives with her mom to save money for college and whatever might be left over for something fun. 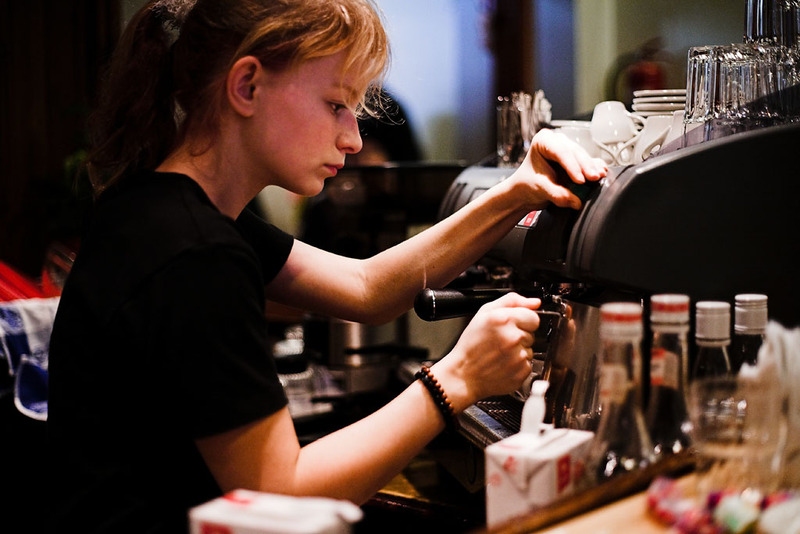 A position as a barista is a great opportunity to make tips in a fast-growing sector within the services industry. Sam is always thinking of ways to make the process go more smoothly. She knows her customers, recognizes the cars, anticipates their orders, and presents their drinks when they reach the window. She’s so good at her job, in fact, that the owner promoted her to a manager role. Sam was pleased and flattered to take on this role, expecting to earn more money, but it didn’t quite work out that way. She is only paid one dollar over the minimum wage! When Sam initially took the job of manager, she worked from 4am to 4pm. In addition to coffee duties, she manages all the scheduling, ordering, stocking, and banking. Almost every morning, the line is endless for hours. The baristas have no time for bathroom breaks. The latte stand must make $350 a day in order to break even. Sam reports they made $1700 just this morning. Yet the owner is unwilling to pay her employees living wage because she can easily find willing applicants who need jobs. And, if Sam works over 80 hours in a time period, she gets no compensation. On top of that, the owner has not increased the pay for the manager in over ten years. Other than quitting, Sam has no options and her boss exploits it. In 2014, the Seattle City Council passed an ordinance granting a $15 an hour citywide minimum wage, led by the workers, Socialist Council Member Kshama Sawant, Socialist Alternative, and 15 Now. During the campaign the owner asked Sam and other employees what they thought. Sam reported that they were too scared to answer this question for fear of being fired if they expressed support. Can Workers Really Make Improvements In Their Lives? Management under capitalism is about rewarding some employees with a little bit more, while they are actually reinforcing the role of the boss. On an individual basis, promotion to a management position is presented as a wonderful opportunity to grow and have a part in creating a great business. But is it? Managers don’t really have a say, in fact, they are implementing the demands of the bosses, and enabling the boss to make even more money off their unpaid labor. This owner has 18 coffee stands and approximately 150 employees – but it’s considered a small business since there are fewer than 500 employees. The majority of jobs created are now minimum wage jobs in the service sectors where the average minimum wage worker is a 32-year-old single mom. They are predominantly people of color who are only earning the national minimum wage of $7.25 per hour – hardly a living wage. In fact, in 43 states the minimum wage for tipped workers is only $2.13 an hour! There are millions of workers like Sam but unlike her, most minimum wage workers do not have many choices. With insufficient hours and thus working several jobs, there is not a way to get ahead simply by going to school and working harder. By oneself, no worker, or even small group of workers, has any chance of taking on the bosses and these powerful corporations. Their real power comes when they band together to fight the bosses who pit them against each other. That’s what a labor union is. By uniting workers in a common organization, it gives them the power to confront the boss. With union protection they can fight for living wages, pensions and good working conditions. In fact more young workers are learning that lesson. According to the Bureau of Labor Statistics, 76% of the increase in union membership for 2017 was workers under 35. It’s easy to see the role of huge corporations as they exploit workers, but many small businesses act in the same way as outlined above. There is sympathy for that owner – the lauded entrepreneur – to succeed. Large corporations use the example of the small family business to deflect demands that they pay higher wages, and to justify their claim that paying higher wages would hurt those businesses. But workers at small businesses also need to make a living wage. The capitalists and their friends in the corporate media make claims that if paramedics and other workers in important jobs are only paid $15 an hour, a burger flipper certainly doesn’t deserve that. But under capitalism you can’t live if you can’t work. No worker can survive on a wage less than $15. The bosses will never give in, no matter how nicely people ask. Actually, large capitalist owners openly admit that they will not tolerate any challenge to their control of the workplace or society. Yet that is our task as workers: to challenge this control, not only of the workplace, but also in society. Previous generations of young workers were forced into struggle by greedy corporate owners in mining, auto, transportation, and hospitals. Workers took on these bosses, formed unions, and transformed their lives through struggle. The battleground today is increasingly the service industry. Amazon, like Walmart, is setting the new norms for the low-paid exploitative workplace. David Dayan writes in the New Republic that salaries are low throughout Amazon’s 80,000-person-plus organization, yet since the year 2000, the corporation has received over one billion dollars in corporate welfare across the U.S., usurping the previous leader: Walmart! And, a 2013 UC Berkeley study determined that overall such persistent low wages cost taxpayers approximately $153 billion every year in public support to working families. Because capitalists refuse to pay their service workers a living wage, workers are forced to rely on social services like food stamps to pick up the slack. Just recently, Policy Matters Ohio found that more than 700 Amazon employees need such assistance in just that state alone! But for millions of workers, this is the only work they can find. The greatest fear of the capitalists is that workers will realize the power they hold and start organizing to present common demands. Under capitalism, young workers have no future. So what happened to Sam? She finally decided to step down as manager due to overwork and underpayment. She just couldn’t keep it up any more. The only option she saw was to quit her job for a slightly better one. While some workers like Sam are able to get ahead, despite stressful jobs, the majority cannot. We urge workers to organize workplaces and join the socialist movement. Socialist Alternative is the organization of Kshama Sawant, Seattle City Council Member, who helped lead the fight for $15 in Seattle, and won. We are economic and social justice activists fighting against exploitation and injustice people face daily, against racism, homophobia, sexism and anti immigrant sentiment.